Sunrise of life began for Wilma J. (Campbell) Gamblin on February 14, 1936 in Athelstan, Iowa and the sunset of her life came on April 13, 2019 at the Pleasant Hill Health and Rehabilitation Center in Pleasant Hill, Missouri at the age of 83 years, 1 month and 30 days. She was the daughter of Noble J. and Ola Thelma (Barnes) Campbell. Wilma spent her younger years in the Athelstan/Cromwell, Iowa area. She graduated from Cromwell High School in 1955. On August 3, 1958, Wilma was united in marriage with Conrad Lee Gamblin at the Nazarene Church in Creston, Iowa and to this union four sons, Kevin Lee, Kendell Gene, Keith Daniel and Kirk Michael were born. As a minister’s wife, Wilma lived numerous places throughout her married life. She was a full time homemaker who devoted her life to her family and her church. Wilma’s spiritual gift was composing and performing hymns and music through song and playing the piano. Wilma was a member of the Chapman, Kansas Church of the Nazarene. She was preceded in death by one son, Keith Daniel Gamblin, Sr.; her parents, Noble J. and Ola Thelma Campbell; one brother, Lenis Campbell; one sister, Lois Irene Conkling; one grandson and one great-granddaughter. Wilma is survived by her husband, Conrad Lee Gamblin of the home; three sons, Kevin Lee Gamblin of Shelby, Iowa, Kendell Gene Gamblin and wife Colleen of Las Vegas, Nevada, and Kirk Michael Gamblin and wife Kristie of Woodbridge, Virginia; one daughter-in-law, Jodie Heard of Galena, Missouri; three brothers, Francis Campbell and wife Sharon of Omaha, Nebraska, Oren Campbell and wife Barbara of Phoenix, Arizona, Merrill Campbell and wife Donna of Colorado Springs, Colorado; two sisters, Marian Drake and husband Kenneth of Omaha, Nebraska, and Cherrill Russell and husband Bill of Olathe, Kansas; seventeen grandchildren, sixteen great-grandchildren, other relatives and many friends. The family of Wilma J. Gamblin will receive friends from 6:00 – 8:00 p.m. Wednesday, April 17, 2019 at the Wallace Funeral Home in Pleasant Hill, Missouri. Funeral Services will be held at 10:00 a.m. Thursday, April 18, 2019 at the Lee’s Summit First Church of the Nazarene, Lee’s Summit, Missouri, with Pastor Mike Buettner officiating. Casket Bearers will be Trent Gamblin, Michael Gamblin, Brian Gamblin, Jeffrey Gamblin, Tyler Gamblin, Gage Gamblin, Cort Gamblin and Mike Felthauser. Interment will be at 5:00 p.m. Thursday, April 18, 2019 at the Howell Memorial Park Cemetery in Pomona, Missouri. 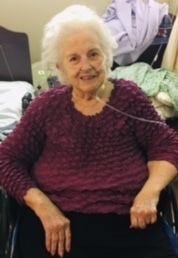 Contributions, in memory of WIlma J. Gamblin, are suggested to the Lee’s Summit First Church of the Nazarene, 900 SW Lakeview Blvd., Lee’s Summit, Missouri 64081. I express my heartfelt condolences for the loss of your dear love one. May the God of tender mercies and comfort strengthen you during this time of sorrow – 2 Corinthians 1:3,4, it is his promise that you will see your love one again, John 5:28, 29. Lee and family, my heart breaks with yours at the loss of your precious Wilma. May the assurance of knowing she is resting in the arms of Jesus bring you great comfort and strength in the days ahead.